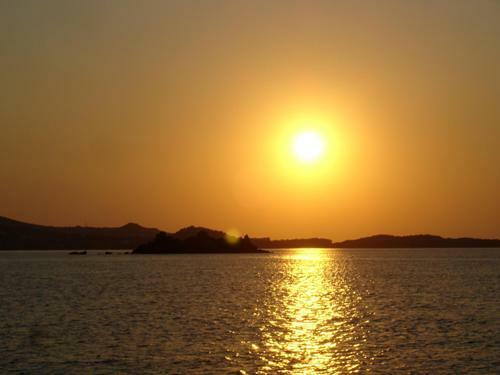 Although Mykonos is one of the smallest islands of the Cyclades complex, it is definitely one of the most famous; owing its name to the son of the King of Delos and because of all its fantastic qualities it has often been named "the jewel" of the Aegean Sea. The island has a mass of natural beauty, affluent history, cosmopolitan character and wild nightlife! A dry, arid island, covering an area of barely 90 sq km, it’s very easy to explore the island in one day! 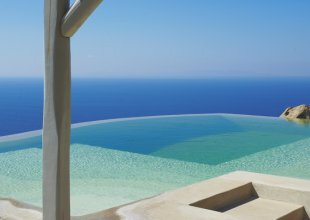 Mykonos is great base for seeing other islands being situated in the middle of the Aegean, lying between Tinos, Siros, Paros and Naxos. Mykonos Town is a grand example of unique Cycladic architecture set around a picturesque fishing-village bay. Totally whitewashed organic cube-like buildings fit closely together to form a jumbled maze of narrow alley ways and streets filled with a variety of shops and restaurants brimming with life. There are white cubicle houses clustered, with their tiny balconies, coloured windows and liliput yards lined by bougainvillea and pots of basilicum. Numerous little churches and chapels, hidden minuscule piazzas and water wells, as well as the multitude of colourful shops are there to further accent this chaotic charming setting. The central harbour is very picturesque, lined with numerous cafes, bars and shops. At the western end of the harbour stands one of Chora's landmarks, the Church of Paraportiani, a whitewashed group of four chapels in vernacular architectural style. Around the corner is Little Venice - one of the most beautiful and romantic places in the whole of Mykonos and offers a fantastic sunset! 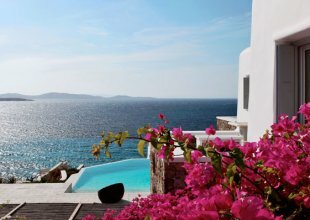 Mykonos attracts people from A-listers and millionaires to backpackers and ravers, it is still at the height of its popularity, and surprisingly, despite its rapid development and numerous, as well as drastic changes, it has managed to preserve its culture and character. 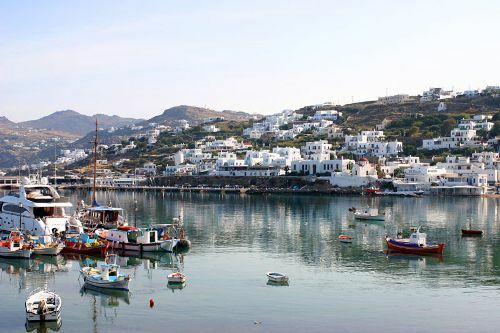 Ano Mera is a small village in the middle of the island - the only inland village on the whole of Mykonos! The village is based around a large central square, which is lined on three sides by a series of Greek tavernas. The monastery of Panagia Tourliani was founded in 1542, is Ano Mera's most significant highlight. 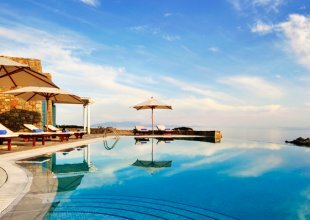 Close to Ano Mera is Kalo Livadi beach (Translated to Nice Bay) here you will find a fantastic beach restaurant with sunbeds and excellent service called Solymar – it is very well known and booked throughout the summer! Agios Ioannis is a small village with just two taverns, one restaurant and one tiny store. Agios Ioannis is famous as the location for the movie "Shirley Valentine", it is very popular as it is quiet, even in August! 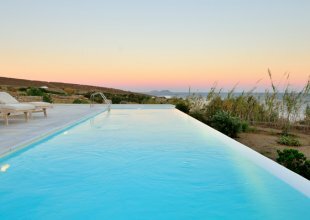 From this part of the island you are protected from the wind and receive stunning sunsets yet you are still close to Mykonos town just a short drive away. Ornos has a lovely beach with tavernas, and a well organized food market with a butcher's shop, bakery, super market and a pharmacy in the village. 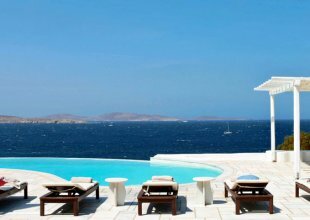 Super Paradise is located 6km south east of Mykonos Town. Super Paradise beach is called paradise for a reason....set in a deep bay – it has a restaurant and disco bar that echo throughout the day and night, it’s the islands biggest party beach. Packed with clubbers, jet-setters, models and even celebrities if you’re looking for some fun in the sun, then this is the place to be!